Like hundreds of colleagues around the world the Scottish Cartoon Art Studio team were shocked and saddened by events last week in France. 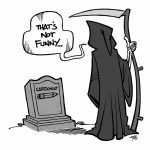 Every death and injury that ensued was a tragedy in its own right but the murder of five cartoonists – Cabu, Charb, Honoré, Tingous, Wolinski – the wounding of a sixth, Riss and the threats directed at a seventh, Coco hit home particularly hard. We know the work of all these artists thanks to our regular visits to the Salon International de la Caricature, du Dessin de Presse et d’Humour in St.Just-le-Martel and were lucky to meet some of them there too. In particular we fondly remember Wolinski sharing cigars and a joke or two with us over dinner during our 2002 trip when the Salon played host to our Auld Alliance exhibition. Our thoughts are with those in France who have lost friends and loved ones and we look forward to contributing to the discourse on freedom of expression and cartooning in particular that will no doubt develop during the coming year.